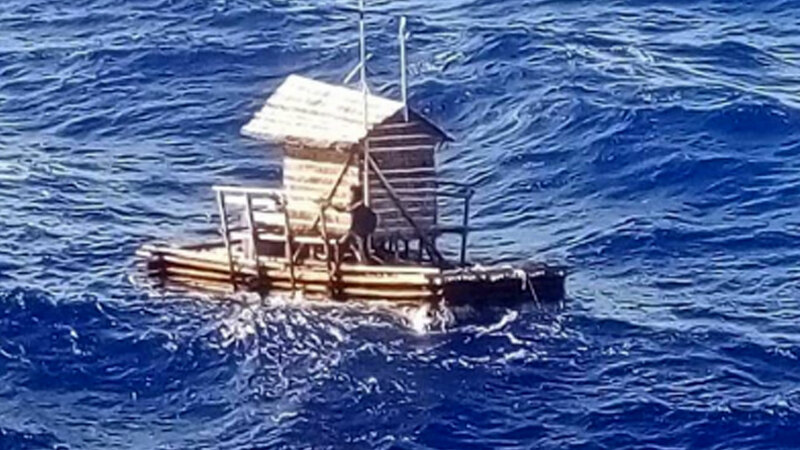 An Indonesian teenager stayed alive for 49 days while floating thousands of kilometres across the Pacific Ocean on a timber hut. Aldi Novel Adilang, 19, was working alone as a lamp keeper in July aboard a floating fish trap 140kms off North Sulawesi in Indonesia when high winds snapped the mooring. He was pushed out into the vast Pacific where he survived on dwindling food supplies until he was rescued by a passing ship in August, reports the Jakarta Post. After being picked up in waters near Guam, Mr Aldi was landed in Japan. He was finally reunited with his family earlier this month. His hopes of rescue were dashed repeatedly when 10 passing ships failed to come to his aid, Indonesian diplomats said. “Aldi said he had been scared and often cried when adrift,” said Fajar Firdaus, a diplomat based in the Japanese city of Osaka. Mr Aldi’s basic hut – known as a Rompong – did have a basic gas-powered stove but no engine or paddle. When his food supplies were exhausted, he survived by catching fish and drinking sea water. “After he ran out of cooking gas, he burned the rompong’s wooden fences to make fire for cooking. He drank by sipping water from his clothes,” said Mirza Nurhidayat, the Indonesian consul general in Osaka. Mr Aldi’s plight finally ended on August 31 when a Panamanian-flagged tanker came to his aid. After waving a cloth at the vessel, the teenager switched his radio to an emergency frequency and the ship’s captain caught the signal. But due to high waves, the tanker was unable to attach a rope to Mr Aldi’s floating hut. After four failed attempts, Aldi made a desperate decision. “Aldi then decided to jump into the sea to grab the rope, while the waves and wind rocked him,” Mr Fajar said. After weeks at sea, Mr Aldi was very weak and nearly lost the rope, but the ship’s crew caught his hand.